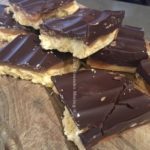 This is a dairy free, egg free Vegan treat that will become one of your favourites to make. The recipe takes a bit of time to set so bear this in mind for timings. Once made it will last for about a week in a airtight container. Preheat the oven to 190 C, 375 F, Gas mark 5. Grease and line a 8"x8" brownie tin. 1. Start by making the caramel as this takes the longest to get ready. 2. Add the caramel ingredients together in a pan and heat on a medium setting, bring to the boil then let simmer for about 20 minutes until the mixture reaches approx 240c, has thickened and has turned a lovely caramel colour. 3. In a clean mixing bowl add the flour, icing sugar and butter/spread together to make fine breadcrumbs and then spread this out in the tin evenly pushing it all down firmly, pierce with a fork and bake for 20 minutes until golden, set aside to cool. 4. 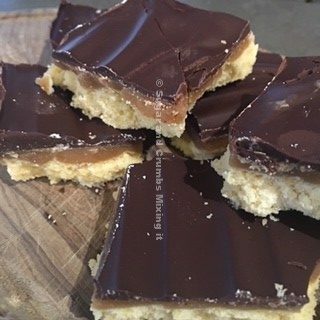 When the caramel is ready pour this over the shortbread base and spread evenly, leave to cool completely then place in the fridge for approx 1 hour until set. 5. Break the chocolate into pieces and melt in a bowl over a pan of simmering water, when its fully melted spread over the top of the caramel and then leave to harden this will take approx 3o minutes to 1 hour. 6. Slice into squares and serve. Eat within 7 days and store in an airtight container.